I’m four deep into my 2013 goal of running 13 half marathons! Check out my Race Recaps page if you want to read about those races OR my Pinterest Board for those too. And while I’m in half marathon shape, I’m not in solid marathon shape. 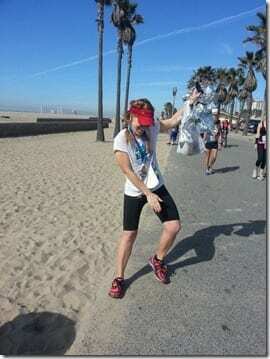 Yes, I just PRd at Surf City but I wasn’t properly prepared for a full marathon. I got lucky Yeahhhh buddy. The LA Marathon is 38 Days away and while I don’t have time for a full marathon training plan, but I want to be smart so I don’t end up with an injury (again, I’ve just been lucky). That’s only 5 weekends/long runs away and I have 2 half marathons scheduled in that time. Add in taper and I really don’t have a lot of time! 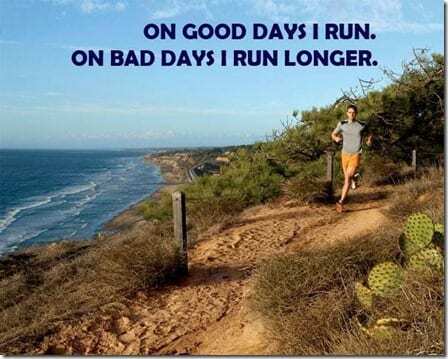 So, I put together a rough schedule of long runs, mid-week runs and cross training days that will help keep me in shape. I actually have walked the LA Marathon course in high school for the March for Hunger that we did every year. So, this is going to be a very cool experience! Plus I have a few friends running too! Yes. A 50k. We’ll talk about it later. 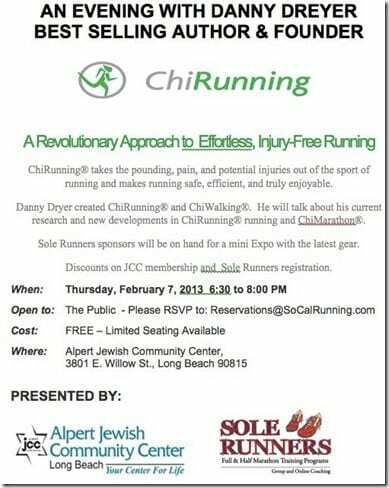 Local Runners: Chi Running talk tonight in Long Beach! I’m going to try and make it, but I’m having a car situation so I’m not sure if I can. Random Question: What color top are you wearing? that trail in the last picture is where i’m running today, actually! 🙂 the guy fleming trail at torrey pines. my favorite. it’s gorg! Black and white striped shirt with a teal cardigan and necklace. Haha that is a random question- yes to the jeans, and black. My sister is running her first marathon this spring at the Boston Marathon (yeah, she’s crazy) and her schedule right now is pretty insane, but I’m kind of jealous! I like the dance moves! Friday = Jeans day at work! yay!!! Navy sweater over white button down (I apparently reside in prepsterville) and sadly no jeans. That is seriously the best medal ever! Love love love it. Have you done a NOLA race? You’ll enjoy it. The half especially. I think that race is approx 65% halfers, and only 35% fulls, the full starts getting a little lonely. Anyhow, great weekend to be in town, weather should be great, and New Orleans is just the best! No I have never been to NOLA so I’m sooooo excited!!! Can’t wait to hear about it then, and what you thought of the race/city! Have a fab weekend. I am rocking a shimmery cream turtle neck sweater; brown leggins. So…I have a half marathon in May (May 2nd). I know I need to start training, but IT IS SO COLD here and I cannot seem to get past 2 miles on a treadmill (I need to look into some treadmill workouts to pass the time/distance better). What do I need, 12 weeks for training? Furthest I have run is 7 miles. And not often (usually do a 5 miler 1x a week)…..
I’m wearing a purple top with skinny jeans. I also have a chunky infinity scarf on because I’m getting prepared for this “huge snowstorm” that is supposed to hit the northeast. Black top with Nike blue, and other colors, running short – gotta get my work-out in! 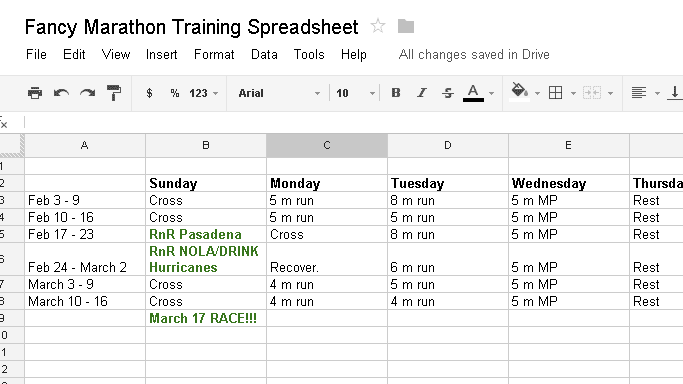 My favorite part of your training plan is to run NOLA and DRINK HURRICANES!!!! Good luck with your training for LA! Dang girl! You’ve got a busy race schedule there. SO FUN! 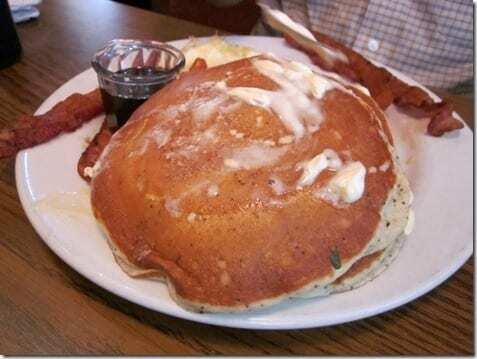 I’m jeally…I can’t wait till I can run without the walk-breaks my PT says I must do! AND…I got excited about RnR Pasadena. I lived in Pasadena for graduate school, and apparently I miss it. And pinkberry. And the sun. But mostly pinkberry…and being able to walk EVERYWHERE. Red shirt with a pin-striped pencil skirt. Oh I wish was a trader or on the trading floor so I could dress down and wear jeans on Fridays. blue, green and white striped top and yes, jeans! ChiRunning…sounds interesting. I’m going to have to look that up! The chi running clinic sounds pretty cool. One of my yoga instructors is also a chi running coach and he incorporates a lot of the movements into our classes. It’s pretty interesting! 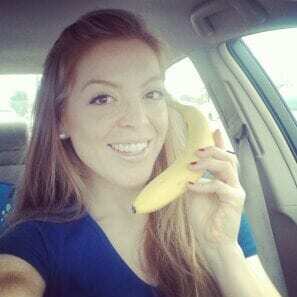 I swear, getting to eat tons of carbs is one of the best parts of marathon training. 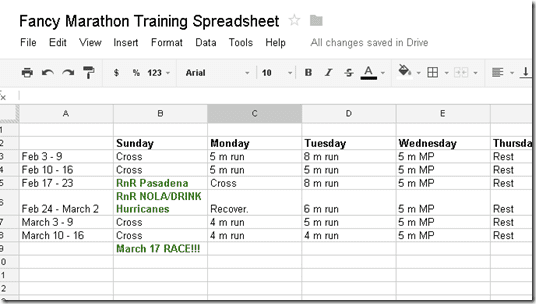 I love that you have “drink hurricanes” on your training plan. That’s fantastic. 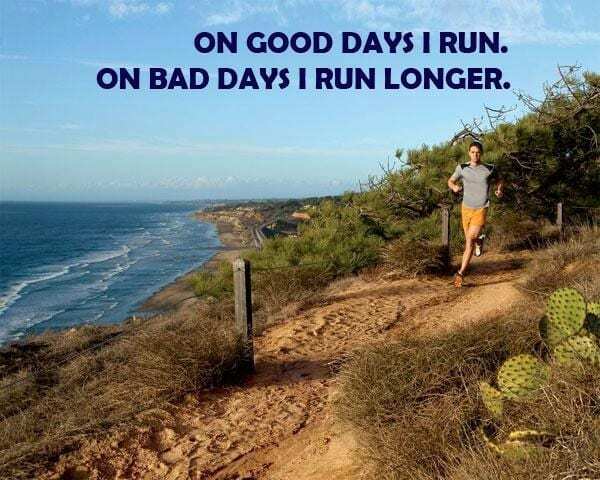 Good luck with your upcoming races and training runs! I have on a hot pink shirt with orange stripes, jeans, and my snow boots. We are getting 8″ right now! 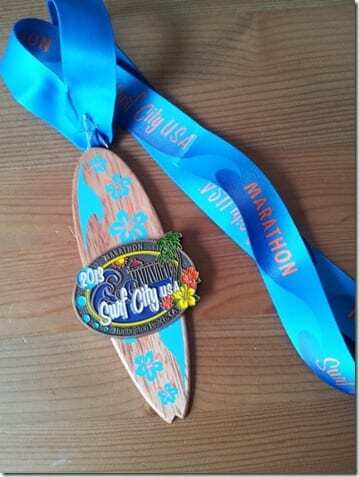 I have serious medal envy after seeing yours from Surf City. Currently I’m still in work clothes; greyish blue dress pants, cream l/s top with a super cute flower scarf (blues&greens&yellows). However in 30 minutes I’ll be changing in to grey-ish capri running pants & a red top. YEA!!!!! Wearing a pink t with an embroidered sheep that reads Baa Haba, Maine. And jeans. 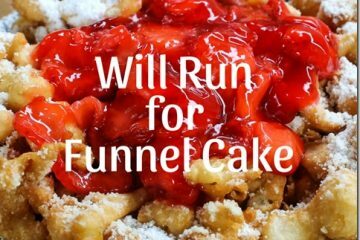 Cold, rainy day here in SC, but planning on heading west to sunny CA for the Color Run SF with family and friends! Teal print blouse with solid teal pants. No jeans at my workplace under any circumstances. OH, ultras are so much fun!! I love the distance! I am wearing a red sweater and grey slacks. So much fun!!! 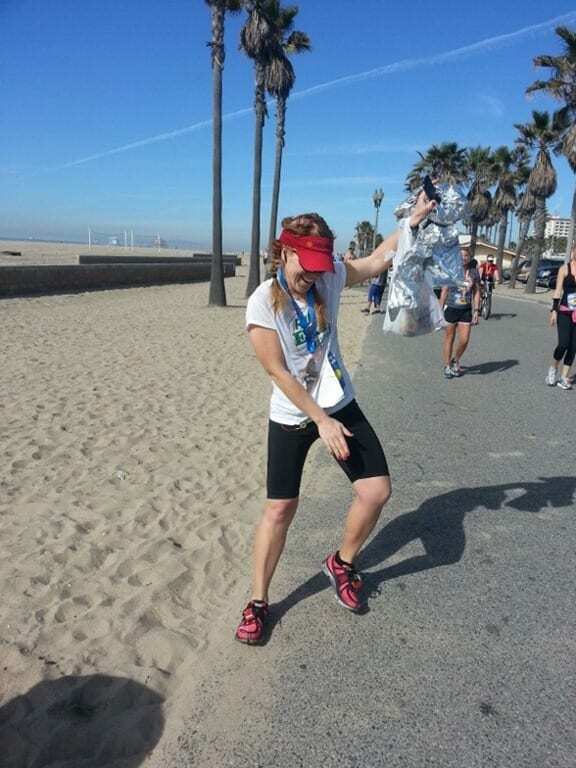 After my first marathon all I wanted to do was run a 50k next because I had so much dang fun. However, my body was tired and I needed a rest and now I’m lucky to be running 5k. My goodness, I do love that medal! I am missing mine…it’s on the nightstand and I am stuck at work. 🙁 I hope it’s nice and warm and isn’t missing me too much. Random answer: Hot pick t-shirt, light pink cardigan and JEANS! Happy Thursday–gettin’ close to Friday! Its red. And yes, I am wearing jeans. Grey and white striped shirt and jeans. I work at home and wear jeans ALL the time. 50k sounds awesome! Good Luck! My husband ran the LA marathon and he said it’s really fun because you can sometimes see celebrities. Good luck with the 50K! Black today. To match my mood. And track pants! Wow- impressive that you’ve already run four halfs this year and have shiny new PRs to smile about, too! EXCITING about the 50k! 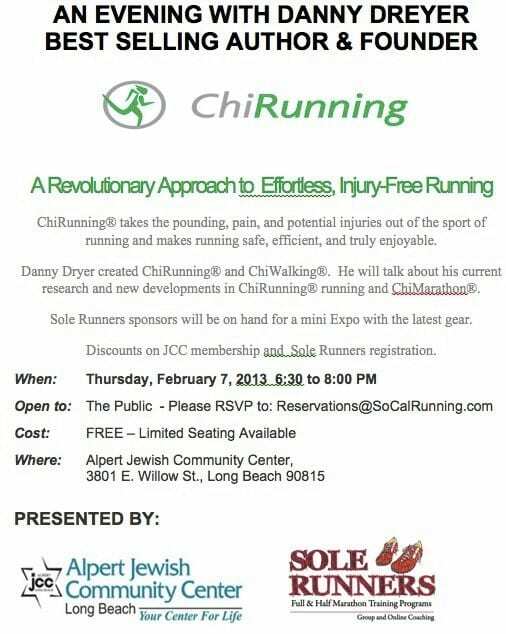 And even more cool about the Chi running talk. I’m trying to change to Pose running (similar to Chi) but it’s not easy! I’m at work so wearing dress pants 🙁 I’d much rather be in spandex or lycra! Just finished working out so I am wearing excercise pants? I don’t know what kind but they are from Athleta. What do you for cross training? For cross training I should do yoga buuuuutttt, I’m bad at living. Jeans? What are those things?! I don’t ever wear jeans. Hello, Victoria Secret sweatpants. Can’t wait to hear more about the Ultra!! LA marathon is going to hopefully be amazing for you! I’m wearing a deep blue top. Is it weird that I CAN’T STAND JEANS?! I have a pair of Gap jeans, that’s about it. I like more formal type pants..or whatever you call them?! You are a marathon machine! Way to go girl, you are such an inspiration! i’m wearing a gray sweatshirt and jeans. it’s freakin’ freezing here in wisco! 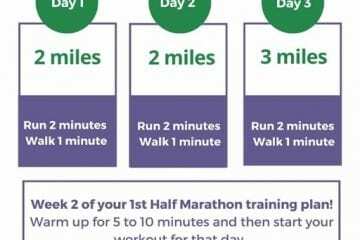 question for you: i’m prepping for a half marathon (late april) and a full marathon in mid may and one at the end of june. i don’t have any real set training plan so i was hoping you could help me and let me know what is working for you since i’ve noticed you’ve really stepped up your game lately and it’s really impressive on your dedication and results. (hello PR mania!) can you offer some suggestions as far as fueling and types of runs you do to increase your speed and endurance? to give you an idea, my best full is exactly 4:00 and i’m looking to do 3:45 this year and my best half is 1:45 and i’m looking to do 1:40. Theresa – sounds like you’re already faster than me with those goals! I don’t have running advice for speed, but I will do a fuel post soon! I’m wearing a brown/pink kinda flowery top, and no to jeans. 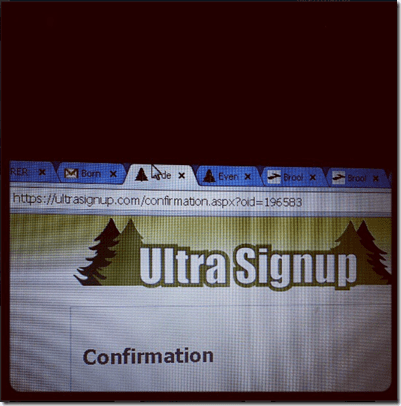 Woo-Hoo for the Ultra! Can’t wait to hear which one/details. I just got back from running and am wearing my blue/white Atlantic City Marathon shirt and black running pants. Classy. An Ultra?! That’s so exciting! 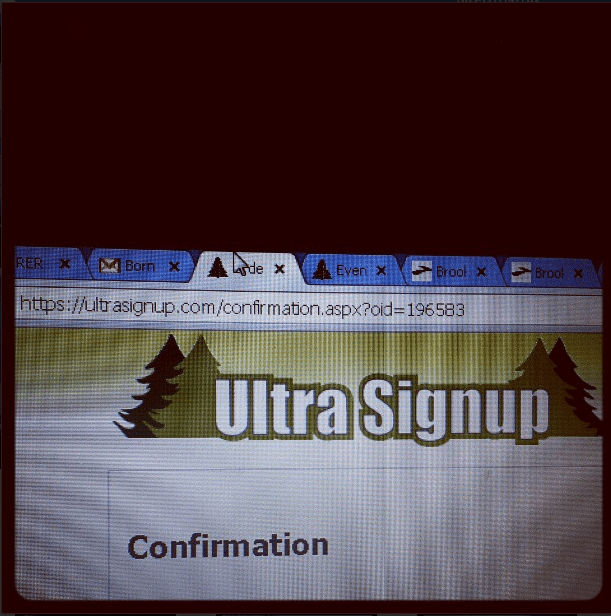 I’ve only run a few halfs so ultra runners are on a whole other level to me. To answer your questions: I am currently wearing a while top with silver sparkles (not as tacky as it sounds). I am at work, and it’s not Friday, so I am not wearing jeans. I’m wearing a gray and white striped shirt, with red jeans and leopard print flats because I’m sick of boots and I’m sick of winter! Um, that outfit sounds super cute!!! Opps not sure how I replied to this comment instead of the wall!